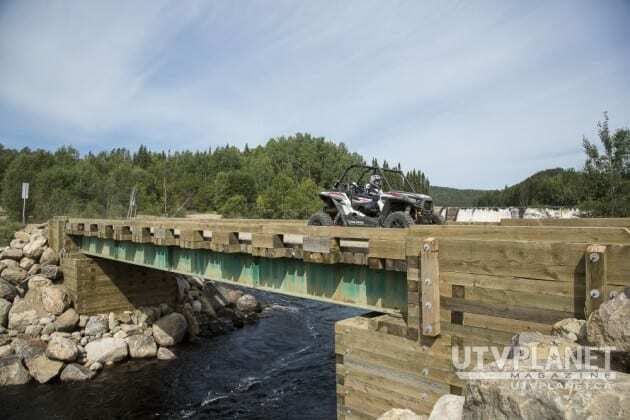 If you read my last piece, you remember that we spent the part of the summer exploring various off-road riding destinations in La Tuque, Quebec. This time around our trip leads us to explore “Parent” and its surrounding trail systems. 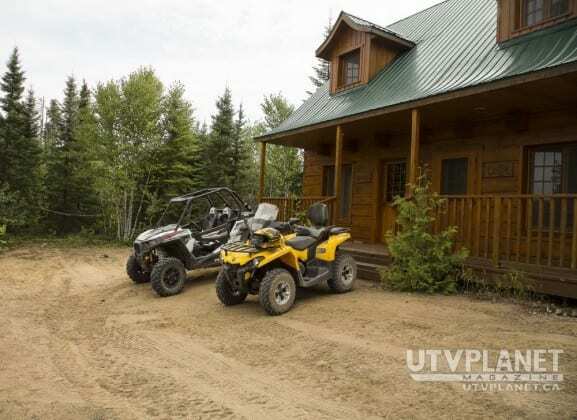 “Parent” is a community in northern Quebec, Canada, located within the City of La Tuque and about 150 kilometers (93 mi) northwest of La Tuque’s town center. For this trip our units of choice would be the Polaris RZR XP 1000 and the Can-Am Outlander L. This was our first excursion in this area and we weren’t really sure what type of terrain we would be tackling, we figured it would be a good idea to take an ATV along in case we faced trail width restrictions. 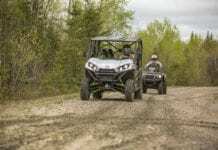 The Polaris XP 1000 can handle anything you throw at it, however if it couldn’t fit through trail barriers it wouldn’t do us much good. We wanted to explore as much of the area as possible and didn’t want to be confined by width restrictions, better safe than sorry, right? With the units firmly secured to our trailer and the truck packed, we started our long road trip to Parent. Upon our arrival at Parent, we decided to go checkout our accommodations prior to meeting up with our guide. For our first 2 nights we would be lodged at “Domaine Ombre du Vent”. Once checked in we made our way to our cottage; it had a rustic look and feel and provided all the comforts and amenities for a welcoming stay. Each unit can accommodate up to 5 people and provides a living area and full kitchen on the ground floor with 2 separate bedrooms on the top floor. Digital TV, Wi-Fi access and not to mention superior comfort and cleanliness, what more can you ask for! Although we didn’t get a chance to take part, “Domaine Ombre du Vent” also offers a wide variety of activities, something for the whole family to enjoy. I should also mention that the installation provides more than ample parking for our truck and trailer. We would like to thank the owners, Andre and Genevieve for their gracious hospitably during our stay and highly recommend “Domaine Ombre du Vent” to anyone visiting this area. After making ourselves presentable, we finally meet up with our guide, Sylvie Lachapelle at “Hotel Central”. “Hotel Central” is the “go to spot” in Parent: it offers to its clientele great meals in its restaurant, weekly entertainment in its bar and over 20 rooms for rent. 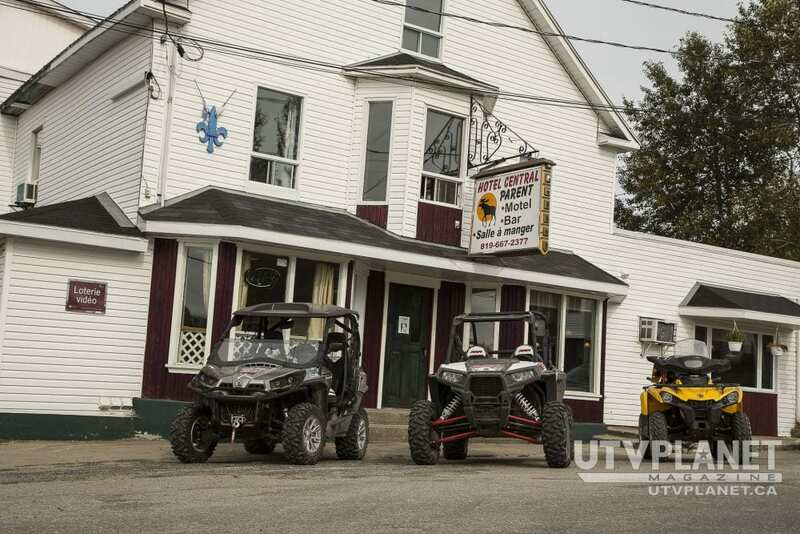 It is a great place to come and unwind and enjoy a few cocktails and good meal after a long day on the trails. Sylvie is a great conversationalist and we learnt some fascinating facts on her subject, some of which I would like to share. Not only does she and her husband run “Hotel Central”, which believe me is no small undertaking with all the patrons which visit on a daily basis. 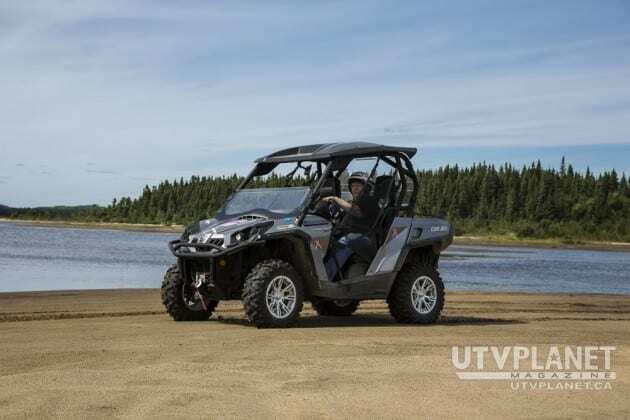 She is also president of the local ATV/UTV club (Club Quad Parent) responsible for the administration and upkeep of the entire local trail system that covers 315 km. Also interesting, all council members of “Club Quad Parent” are women, way to go ladies! To this add the fact that she also resides on the council committee for “Ville de La Tuque” and is a guide in her spare time. I mean “WOW !” a truly incredible woman with more than her hands full. The next morning we meet up with Sylvie, which had already planned our ride itinerary for the day and after a hearty breakfast we were ready to hit the trails. We made a quick stop at “La Montagne du Radar” which is approximately 8 km from Parent. 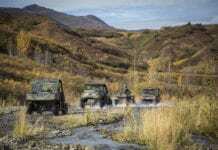 “La Montagne du Radar” is a dismantled military installation and is the highest summit in the region; from its peak you can enjoy a panoramic view of the area. Although we never visited this area, we had heard of the “manually operated ferry” which allows you to cross Bazin River, so we had to check it out. After a short ride along some picturesque trails, we reached the ferry. Basically the “ferry” is a floating platform that you drive your vehicle onto and use a cable and pulley system to pull yourself across, a very unique experience indeed! 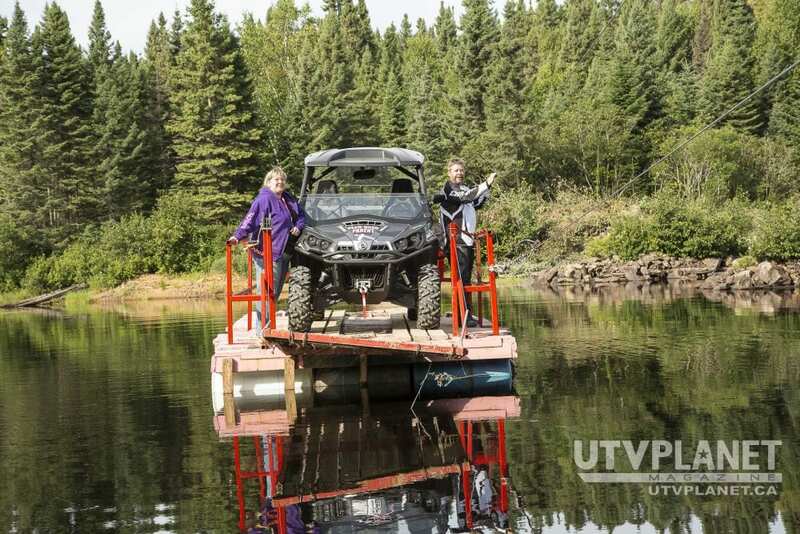 Be warned, at the time of this article the ferry only accepts vehicles 60 inches in width! There are plans do revamp the installation to accept larger units, however this remains an ongoing project. 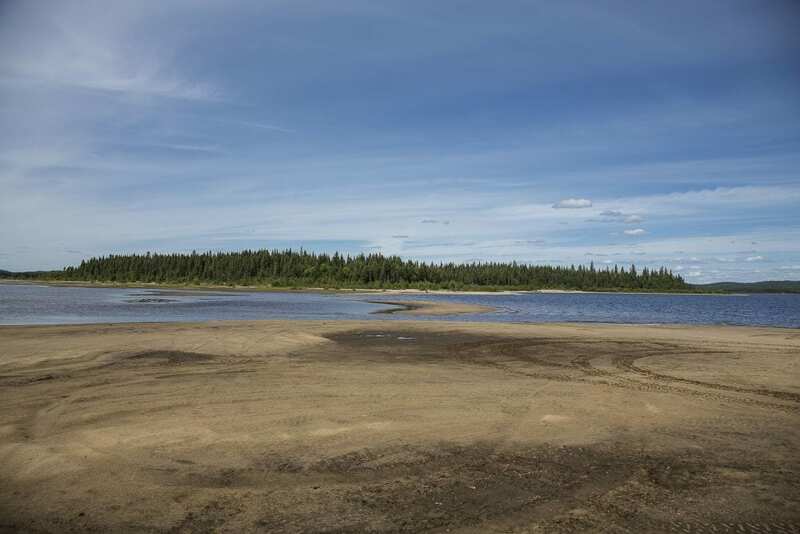 The next part of the journey was the highlight of the trip for me when Sylvie took us to visit a lakeside beach. 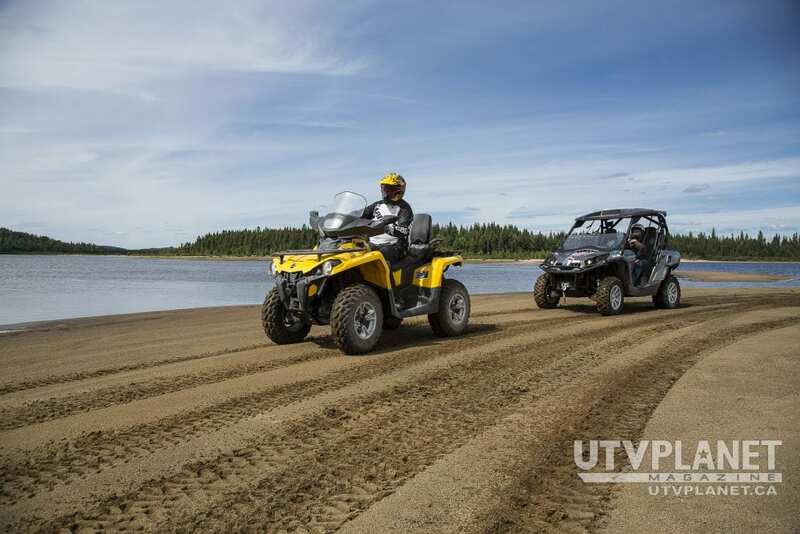 Several kilometers of lakeshore riding along sandy terrain, which offered picture perfect vistas. The trails lead us to small sandy island point where we had to stop and soak in magnificent environment surrounding us. We all enjoy hitting the trails for our own personal reasons, for me being able to take the time and enjoy such a scenic decor is what trail riding is all about! The rest of the afternoon was spent exploring the local trails surrounding Parent before heading back to our camp. Our evening was spent at “Hotel Central” alongside some good company and food. We also got a chance to take part in the weekly entertainment provided by a local cover band. “Hotel Central” was filled to its capacity and this experience just confirmed to us that “Hotel Central” is the place to be while visiting Parent. The next morning rolled around, too quickly may I add, and our destination for today would be Clova. Clova is a hamlet within the city of La Tuque, Quebec, Canada, in the Mauricie region. Clova is best known for the Clova railway station, built as part of the National Transcontinental Railway, now part of the Canadian National Railway. Distance between Parent and Clova (trail riding) is approximately 105 km; with our gear and lunches packed we were ready to start our journey. Approximately 20 km into our ride is where we made our first stop at the “Barrage Rivière Bazin”. 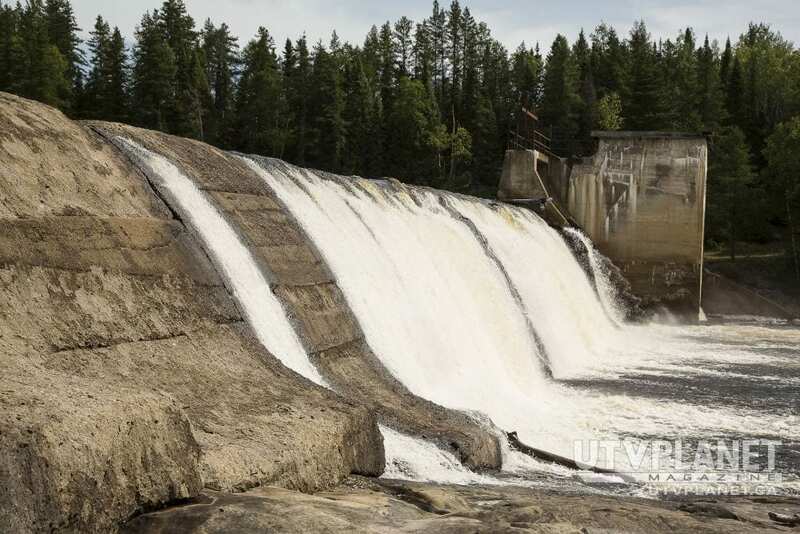 Once a Hydro-Quebec dam, this is now a frequented stop enjoyed by trail riders. Depending on the time of day and weather conditions when you visit, this location has somewhat of an eerie look, a place forgotten by time, which provides many photo opportunities. We spent the rest of the day making our way along the trails toward Clova. All the trails we encountered along our journey provided for exceptional trail riding, nothing too extreme so that even the novice trail rider could enjoy. This is the opportune moment for me to mention that although the trails are clearly indicated, I recommended the use of a GPS. Also, essential riding and safety gear and the use of dusk masks if you are a large group. We pulled in to Clova in late afternoon, as we pulled in I clearly remembered memories from my younger days spent hunting with my Dad in Clova. It seemed as time stood still for Clova, nothing seemed to have changed. Our group meet up with Dominic Vincent owner of “Auberge Clova” where we would be dining and spending the night. This inn is the perfect place for those seeking a truly authentic “woodsy” experience. Set on a hill in the village, this former school was fully renovated and converted into an inn. After a great meal and a solid night’s rest, it was time to say goodbye to Clova and make our way back to Parent. The return trip was just as gratifying and although the same trails were taken, it still provided us with a unique riding experience. We pulled into Parent just in time for lunch, grabbed a quick bite, packed our gear and bid farewell to our newfound friend Sylvie and started our long route home. I would like to bring one last item to your attention. 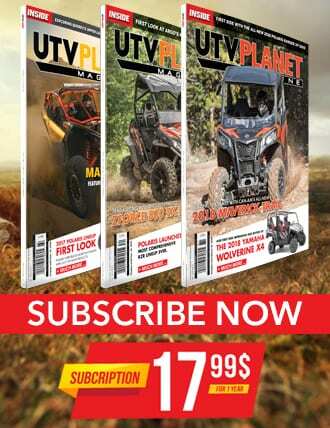 If this area interests you, however you are concerned about a long road trip hauling your ATV or UTV, there is an alternative. 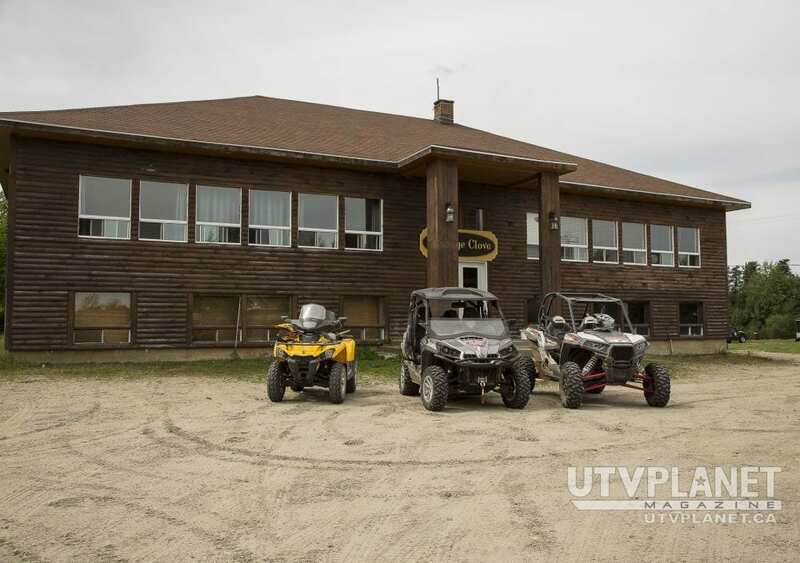 “Randonnée Parent Inc.” offers ATV and UTV rentals and they are located right in Parent. 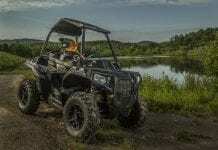 They offer very affordable rates, new units and carry the Can-Am product line-up. Contact Gino Civitares from “Randonnée Parent Inc.” he will be more than happy to assist you. 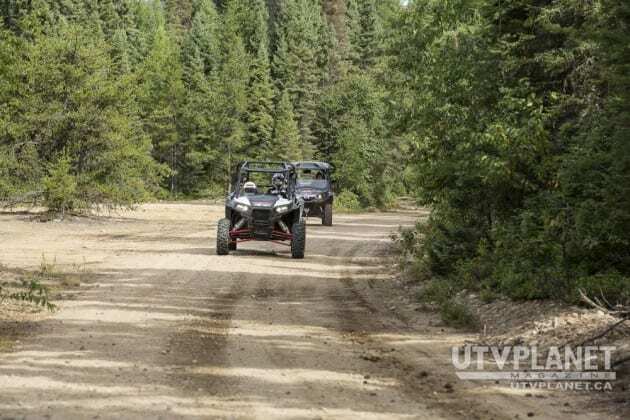 In closing, you may remember from the start of this article that we brought an ATV along with us in case we encountered any trail width restrictions. Well I am pleased to report that besides the “ferry” (60-inch width) there is no need for concern, all trails can easily handle 64-inch units. We would like to take a moment and show our appreciation to Haute-Mauricie Tourism for planning the logistics of this trip, and our guide Sylvie Lachapelle for planning our incredible itinerary and showing us the way. Below you will find a reference guide to the places we stayed during our trip. If the places we described sound like the type of accommodations you would like to visit during one of your trips, please use the links below to get additional information.